Every year the EU loses between €50-70 billion as a result of corporate tax avoidance as companies escape taxation by shifting assets. That is five times the amount spent in 2015/2016 on the refugee crisis. The Commission will allow tax authorities in the bloc’s 28 countries to exchange key information related to activities of multinationals on an automatic basis as part of its Anti-Tax Avoidance Package, it announced today (28 January). 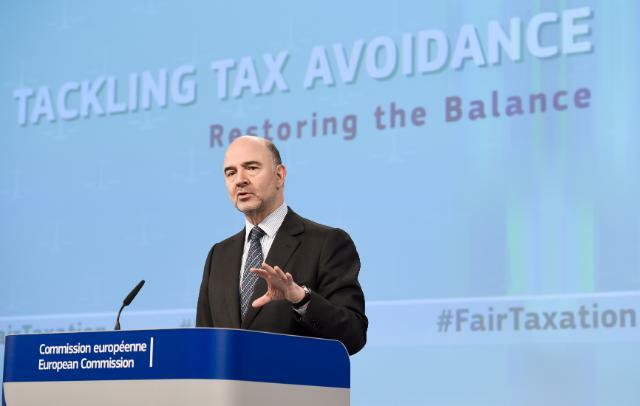 Member states will still set their own corporate tax rates, but the package would outline a set of common ethics, Pierre Moscovici, the EU’s economic affairs Commissioner, said in Brussels. “The days are numbered for companies who try to do tax avoidance,” he said. Tax authorities will exchange information on profits earned and tax paid in each member state. But data from such country by country reporting will not be made public, at least not at this stage. The Commission could make the reporting public if an impact assessment showed it wouldn’t undermine competitiveness. The results are due in Spring. Moscovici said he was personally in favour of public reporting but that a step by step process was necessary. EU law already requires public country by country reporting for banks and mining companies. Tove Ryding, tax justice coordinator at the European Network on Debt and Development (Eurodad), argued that it would have been a crucial first step forward for the Commission if multinationals had to publicly report where they make their profits and where they pay their taxes. Instead, this secret reporting will keep parliamentarians, journalists and the general public in the dark. “This package is woefully inadequate to stem the tsunami of scandalous cases of multinational corporations failing to pay their taxes. The system needs real reform, not piecemeal solutions,” said Ryding. The Luxleaks scandal from late 2014 revealed that some of the world’s biggest companies, including PepsiCo and Ikea, had lowered their tax rates to as little as 1% in secret pacts with tax authorities in Luxembourg. The leaks, published by a consortium of investigative journalists, embarrassed Commission President Jean-Claude Juncker who was the prime and finance minister of the country when these tax schemes were set up. In October, Competition Commissioner Margrethe Vestager hit Fiat and Starbucks with large back taxes bills after the companies were granted selective tax advantages in Luxembourg and the Netherlands. A further anti-tax avoidance measure as part of the new package includes a black list of non-EU countries suspected of being tax havens. It will be based on indicators defined by the Commission but member states will decide which countries should be “screened”. Diarmid O’Sullivan, a tax justice policy adviser at ActionAid, said multinational companies were still able to shift their profits to subisidiaries, and minimise their tax payments. The initiative could spark a race to the bottom on corporate taxation. This would then have a knock-on effect in poor countries, where tax revenues are badly needed to pay for poverty-reducing public services like health and education. But the French Commissioner rejected this claim. He said it would be prevented by the EU’s fiscal rules and the need for resources for for example public policies and services, particularly at a time where the needs are quite high such as during the refugee crisis. The Anti-Tax Avoidance Package will now discussed over the next six months in the Parliament and Council, as part of the usual legislative process. It builds on the Base Erosion and Profit Shifting (BEPS) guidelines agreed by the OECD last year. Since “there’s a real push from society”, Moscovici said he hoped that the architecture of the package will be adopted within six months. The Dutch, current holders of the rotating six-month presidency of the EU, which will steer negotations. Since the Dutch Starbucks case has illustrated that the Netherlands is a tax haven, this rather optimistic, said Aurore Chardonnet, Oxfam International’s EU policy advisor on inequality and taxation. On Thursday morning, Vestager said in an interview with the BBC that the UK government’s controversial tax deal with Google could fall foul of European competition rules. Vestager said these so-called sweetheart deals between member states and companies were unfair and could amount to illegal state aid. Google’s €171 million back tax deal with British authorities was hailed by the UK government as a major success but was dismissed as “derisory” by the opposition Labour Party and criticised by other parties. A Commission spokesman later confirmed that the executive had received a complaint from the Scottish National Party about the Google deal. The letter would be assessed and then a decision would be made on whether or not to investigate. The Labour Party has also sent a complaint. Google could be forced to pay more back-taxes if the deal is found to have breached state aid rules. Fiat was recently ordered to pay back taxes of around €30 million. "We welcome the commission's proposal to increase the exchange of information between tax administrations. After the automatic exchange of information on tax rulings, it's time for each EU country to report information on assets, employment or paid taxes. Though there must be sufficient safeguards for the protection of sensitive information." “This is a crackdown on tax avoidance with giant loopholes” said Veronica Nilsson, the Confederation of European Trade Union's (ETUC) deputy general secretary. “As a global accountancy body, ACCA is a supporter of the EU’s commitment to play a major role in the fight against tax evasion and tax fraud. ACCA is pleased that the European Commission is striving to put together a common set of measures across the EU." "We would however urge EU decision-makers to avoid creating a separate set of EU rules, which would be different to the ones set out by the OECD. Aligning the EU position on interest deductibility with the OECD’s proposed approach is a key example of where a constructive approach towards creating a genuinely coherent global system has been taken”, Chas Roy-Chowdhury pointed out. Spring 2016: The Commission is likely to put forward plans to further boost country-by-country tax reporting by companies. Gidiot aka Osborne is a cretin, liar & deluded if he thinks the deal with Google is “good” – that said – such verbal vomit from tory-vermin ministers is farily normal – they regard much of the Uk population as scum/proles & as such they have little interest in the well being of the country. TheUK Google deal shows this. Tory-vermin are only concerned with one thing: politcal power & gathering sufficient in donations & bribes to fund their efforts to stay in power. This Commisssion will not support a common corporate tax rate. That is a guarantee that corporate tax avoidance schemes will florish and continue. Since lifting company taxes to their proper level would result in loss of shareholder revenue these elites will do their all to avoid that but the rest of us will get screwed to make up for the loss of income. Another great example of how the rich are skewing the system to benefit themselves and disadvantage the poor.